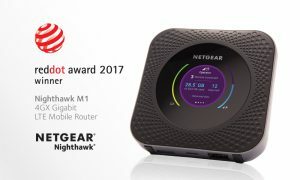 Over the past several years, NETGEAR has clearly increased our commitment to design, and now we are pleased to have been honored with six new awards for recognition in Product Design Excellence, from the prestigious Red Dot international design competition. Four years ago, there were no in-house designers working with the NETGEAR engineers and product management teams. In 2013, James Hathway became our first, and only, Senior Industrial Designer for the company. Since then, James has designed the Nighthawk M1, as well as helped create the unique Quadpod, and has also overseen many other designs for NETGEAR. When James designed the impressive Nighthawk M1 mobile router, he wanted to completely overhaul the previous form factor, which the company had used for several years. The Nighthawks had entered a new realm in terms of speed and performance, and he worked closely with the engineering team to arrive at a form factor with a refined aesthetic incorporating new elements, like a round shaped LCD screen. 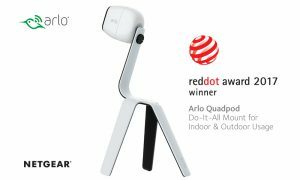 In designing the Quadpod, we were looking to deliver something greater than just a standard tripod to mount the Arlo cameras on, so we focused mainly on functionality. We envisioned being able to fully wrap the mount around anything possible, to manipulate the camera position as best as possible. 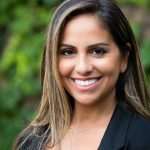 Over the past 4 years, NETGEAR has made a much more concerted effort to focus on User Experience Design, or UX. When making networking and IoT products, we know that UX and industrial design work hand in hand. When James Hathway first started working at NETGEAR, there were no User Experience designers working in-house either. Today, there are 7 team members that work full-time at NETGEAR on UX design. NETGEAR also works with local design agencies and contractors, as design is a fluid process with lots of iterations, and, as anyone working in this field can attest, designing often works better with more eyes, minds and hands involved, to engender even more creative ideas. 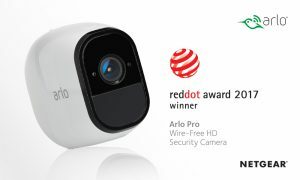 The local agencies and contractors we hired worked with NETGEAR designers to create the Arlo Pro, which was an evolution of the original generation Arlo, as well as the Nighthawk S8000 switch, Nighthawk X10 AD 7200 Smart WiFi router, and the Orbi Tri-band WiFi system. 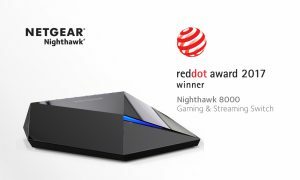 The Nighthawk Switch S8000 was designed to fit in nicely with the existing Nighthawk line up of WiFi routers and is made up of authentic materials such as heavy die-cast metal alloy, which conveys a very high-end quality through its tactile form and performance. 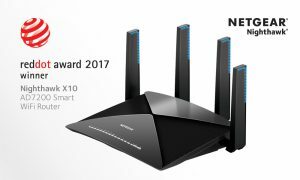 The Nighthawk X10 has also been designed with the use of sharp angular lines, which showcase a sense of power and high performance with the aggressive stance. 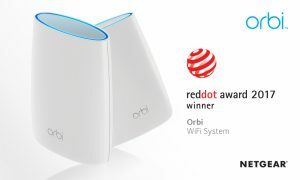 And finally, the Orbi Tri-band WiFi System. The smooth white vase-like router was designed specifically to look like the polar opposite of our Nighthawk line. It was created with a more inclusive design in mind, in order to fit into any modern home. NETGEAR knows that industrial design needs to embody elements of user experience design, and vice versa. NETGEAR wants our products to be as well-rounded as possible, and we aim to design a stellar experience for our users, and so we are so thrilled to be recognized, for the 3rd year in a row, by Red Dot with our 6 awards in product design excellence. If some one needs expert view concerning blogging and site-building then i suggest him/her to visit this blog, Keep up the pleasant work.